This article first appeared in The Edge Malaysia Weekly, on October 3 - 9, 2016. THERE is a mini government within the federal government and it can be found right in the Prime Minister’s Department. For starters, there are nine ministers in the Prime Minister’s Department overseeing matters like the Economic Planning Unit (EPU), religious affairs, law, Parliament, small and medium enterprises, national unity, integrity and innovation. There are also three deputy ministers. Policy analysts and political observers have long bemoaned the bloated Cabinet but in recent years, many have pointed out that the Prime Minister’s Department too has been growing. The Prime Minister’s Department has several components to it. Traditionally, it also covers the operations and budgets of specific departments like the public prosecutor’s office and anti-corruption enforcement agency and statistics department. However, the largest component, which also takes the lion’s share of the budget for the department, is the Prime Minister’s Office (PMO), which was set up to help the prime minister operate. According to recent estimates of federal expenditure, the PMO has 51 divisions that govern a vast range of things. This certainly was not the case 10 or more years ago. Apart from its own administrative unit, the PMO includes the EPU, Implementation and Coordination Unit, National Security Council, Department of Islamic Development Malaysia (Jakim), Syariah Judiciary Department Malaysia and Public Complaints Bureau. There are also various authorities that oversee the development of Malaysia’s five economic corridors, as well as the Performance Management and Delivery Unit (Pemandu) and Talent Corp Malaysia Bhd. As the size of the PMO ballooned, so too its budget. 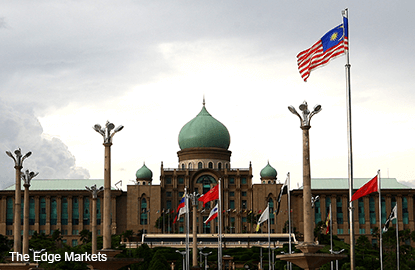 Several glaring trends appear from an analysis of publicly available data on actual budget spending for the Prime Minister’s Department under the tenures of Najib and his predecessors, Tun Abdullah Ahmad Badawi and Tun Dr Mahathir Mohamad. Firstly, the total budget for the Prime Minister’s Department seems to have grown at a quickening pace, particularly in the last 10 years. In fact, it has doubled every decade — from RM1.15 billion in 1986 and RM2.385 billion in 1996 to RM5.839 billion in 2006. Consider that it stood at RM8.938 billion in 2008, the last year of Abdullah’s tenure, before breaching the RM10 billion-mark in the next year to RM12.617 billion under Najib’s administration. Granted, absolute amounts alone are not entirely useful points of comparisons. It is not a fair picture to only look at the department’s current total budget and compare it to that of the past. For a more accurate picture, look at Charts 1 and 2 for a compilation of the budgets for the Prime Minister’s Department and federal government from 1980 to 2016, inflation-adjusted to 2015 prices. One plausible explanation for the rising budgets is that Malaysia has grown substantially since the 1980s, the population has increased, the country has developed at a rapid rate and the economy is vastly more complex. “The cost of governance goes up over the years. Administration gets more complex because the structure of the economy and the challenges also get more complex,” says a person familiar with the civil service administration. On the other hand, some argue that while the cost of public administration goes up every year, there are a number of measures in place to improve efficiency and productivity. In fact, there are agencies (coincidentally under the Prime Minister’s Department) like the Malaysian Administrative Modernisation and Management Planning Unit (Mampu), the Special Taskforce to Facilitate Business (Pemudah) and the Government Transformation Programme (GTP) tasked with enhancing public service delivery and bureaucracy. So it may be more helpful to look at the size of the Prime Minister’s Department’s budget in relation to the year’s federal government allocation. What this indicates is how much the prime minister allocates to his own office’s use when drafting the budget for the entire federal government (see Chart 3). During Mahathir’s tenure, the budget for the Prime Minister’s Department was between 2% and 5% of the total federal government budget, and during Abdullah’s administration, between 3% and 4.6%. But under the present administration, the share has risen to 6% to 8.7% of the total federal government budget. A deeper look into the budget spending in the last five years shows that there has been significant concentration of resources and power in the hands of the prime minister. There are also other divisions within the PMO that could have been under the jurisdiction of other ministries. The oft-cited example is the Commercial Vehicle Licensing Board and the Land Public Transport Commission (SPAD), which come under the prime minister’s control and not the Transport Ministry. Then, there is the 1Malaysia People’s Housing Programme (PR1MA) that is not under the Ministry of Housing and Local Government. There are also the Eastern Sabah Security Command (Esscom), Maritime Enforcement Agency of Malaysia, Civil Defence Department and National Disaster Management Agency that do not come under the Ministry of Defence or Home Affairs. Kluang member of parliament Liew Chin Tong, who has also analysed these numbers, says the data clearly points to a substantial rise of funding for the Prime Minister’s Department under Najib. .
“The key difference now is that the total allocation to the Prime Minister’s Department and the share of development budget taken by the PMO all spiked in Najib’s time,” says Liew. Liew points out that one of the main culprits is in the development expenditure allocated to the Prime Minister’s Department. The federal budget generally gives a bigger allocation for operating expenditure. The 2016 expenditure estimates show that about 19.5%, or RM52 billion, of the RM267.224 billion federal budget was allocated to development. But from that RM52 billion, a substantial 27.55% or RM14.326 billion was funnelled to the Prime Minister’s Department (see Chart 4). According to Liew’s analysis, the PMO’s share of the total federal development expenditure has risen from 14% in 2010 (Najib’s first full year in office) to 27.5% in 2016. So, what kind of development did the Prime Minister’s Department spend money on? There is a RM3 billion allocation in 2016 under the “Facilitation Fund”, ostensibly under the 11th Malaysia Plan. The Facilitation Fund was introduced as part of the Economic Stimulus Package in the Ninth Malaysia Plan (9MP) and a further RM20 billion allocated under the 10MP to encourage private sector participation in projects. Other items that received funding in the billions included PR1MA (RM1.62 billion), development of Malaysia’s five economic corridors (RM2.425 billion) and Projek Mesra Rakyat (RM1.332 billion). “The bloated Prime Minister’s Department is one thing, but there is also a lot of discretionary spending. If you do away with all these discretionary funds, you can save about RM8.5 billion,” says Liew. Given that Budget 2017 is expected to be tight, could prudence start at home?